Sewer cam inspections are vital when purchasing a new home. Forgoing this service can lead to serious damage to your sewer system and potentially cost thousands of dollars in repair bills. Most importantly, sewer camera inspections are not included in a regular inspection as the lines are not visible without specialized equipment. 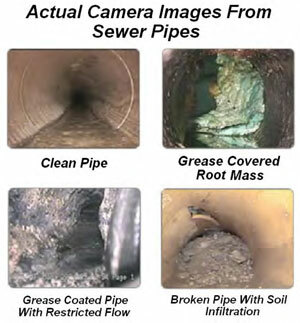 Sewer cam inspections are the only way to ensure your sewer system is functioning properly. 1. Cost – finding a potential problem before buying the house can save you thousands of dollars in repair bills. Serious repair expenses will be incurred if a tree root or any other blockage exists in pipes. 2. Time – Finding a potential problem before purchasing the home can save you a lot of time if repairs are needed. 3. Stress – Nothing can be more stressful than buying a home only to discover tree roots in your sewer pipeline costing thousands of dollars in repairs. 4. Visibility – Non-camera inspections can only detect issues via the naked eye. The majority of sewer pipeline issues occur beneath the surface ONLY visible via a sewer pipe camera. Here are some examples of what might be lurking beneath the surface when a Sewer Camera Inspection is performed. Call or email our office today to find out more or schedule your sewer camera inspection.